Proprio quando le decisioni si fanno più difficili (bioetica, finanza, …) , quando la gente ha bisogno di sperare la politica inglese (solo quella?) ha una fifa blu di parlare di religione. Earlier this year, Nicholas Sarkozy …. called for a “blossoming” of religions. “A man who believes is a man who hopes,” he said. It is ironic that politicians in this country have abandoned belief – at the very moment that the people need hope. 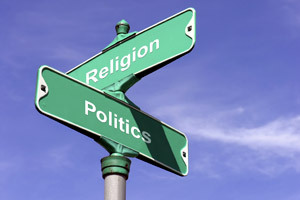 The Archbishop of Canterbury likes to say that religion is getting increasingly political just as politicians become ever more interested in subjects that have traditionally been the domain of religion. For once, he has never been more right. This week the House of Commons will vote on government proposals to allow the creation of human-animal hybrid embryos for scientific research. At the same time, MPs are pushing for changes to the law on abortion. The assisted suicide of the rugby player Daniel James has reopened the debate about euthanasia. The rows over headscarves, the blasphemy law, science education and Lords reform all show how the boundaries have been blurred. Meanwhile, in the City, Mammon has been exposed as a false god whose worshippers seem to have been sacrified on the altar of the credit crunch. There is a yearning for answers that go beyond interest rates, targets and the public sector borrowing requirement. The bishops have started bashing the bankers. Yet politicians, of all parties, have never been more fearful of faith. Certainly, politicians find it easier to “come out” as atheists than to profess that they have a religious faith. Nick Clegg, David Miliband and George Osborne have all said recently that they do not believe in God – something that would be unthinkable in the United States, where presidential candidates compete to win over religious voters. Although David Cameron sends his daughter to a church school, he describes his faith as being “like Magic FM in the Chilterns”, something that fades in and out, as if he is rather embarrassed by the whole idea. There is a curious mismatch here. MPs place their hands on a Bible when they swear the Oath of Allegiance on taking up their seats; prayers are said every day in Parliament – and yet the favourite book for politicians on holiday last year was The God Delusion, Richard Dawkins’ atheist tract. It would be hard to find an MP who prefers the God-fearing C.S. Lewis to the divinity-baiting Phillip Pullman. There has been a believer in Downing Street for the past 11 years. Tony Blair, the first prime minister since Gladstone who slept with a Bible beside his bed, once said that his Christianity and his politics “came together at the same time” – he even claimed that “Jesus was a moderniser”. Gordon Brown, who keeps a moral compass under his pillow, regularly cites his father’s sermons in his speeches. He wants the markets to rediscover the importance of ethics. But the cynical hothouse of Westminster is dismissive of the idealism of faith. Most Labour MPs agree instinctively with Karl Marx, that religion is the opium of the masses. As for the new Tories, it is just not right for their Converse trainer image if the Church of England is still seen as the Conservative Party at prayer. It is as if the end of ideological divides has weakened the wider power of belief. When Alice Thomson and I interviewed Phil Woolas last week, his comments on immigration hit the headlines – but it was his suggestion that the Anglican Church would be disestablished that got Downing Street in a jitter. The minister’s claim that the link between Church and State would be broken within 50 years because “a modern society is multi-faith” was potential dynamite, with implications for the monarchy, the armed forces and the judiciary as well as Parliament. In fact, Mr Brown has already started to break the link between Church and State – he has given up the power to appoint bishops and is considering a plan to abolish the Act of Settlement, which ensures that only a Protestant can succeed to the throne – but he had hoped to move to the point of disestablishment by stealth. It would be wrong to suggest that Britain is any longer a Christian country in terms of the population – only 7 per cent of people regularly attend an Anglican church. Yet neither is Britain a secular State like France. Its history, culture and constitutional settlement are based on the link between Church and State. Earlier this year, Nicholas Sarkozy criticised the French republic’s obsession with secularism and called for a “blossoming” of religions. “A man who believes is a man who hopes,” he said. It is ironic that politicians in this country have abandoned belief – at the very moment that the people need hope.